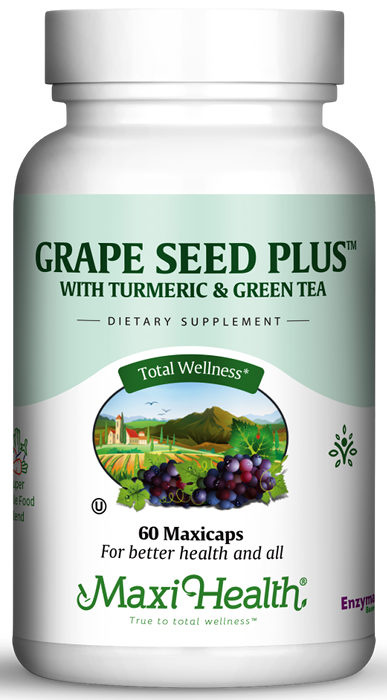 Maxi Health's Grape Seed Plus™ is an antioxidant formula with your requirements in mind! Grape Seed has high bioavailability and conserves vitamins C and E. Grape Seed Extract contains proanthocyanidins. These are powerful free radical scavengers that offer more nutritional support than vitamin E! Turmeric offers you powerful support for healthy inflammation response, is an antioxidant, and is a mood and cognitive support agent. Green tea supports digestion, weight management, and is a super antioxidant in it's own right. It's time for you and your loved ones to make Grape Seed Plus part of your nutritional routine! Take one (1) Maxicaps once or twice daily with meals, or as directed.